As the well is being drilled, a thinner steel pipe is added to stabilize the wellbore, which prevents it from collapsing and helps reduce water and contaminants from entering the wellbore. Cementing is used to set the casing in place. Well stimulation uses physical or chemical means to increase the flow of hydrocarbons in the reservoir. Service companies stimulate a well by pumping liquid down the wellbore and into the reservoir at high pressures. Stimulation can involve acidizing, fracturing, or both. With acidizing, acid is injected under pressure into the rock formation. The acid dissolves channels in the reservoir, thereby increasing reservoir permeability near the wellbore and, thus, increasing the flow rate. 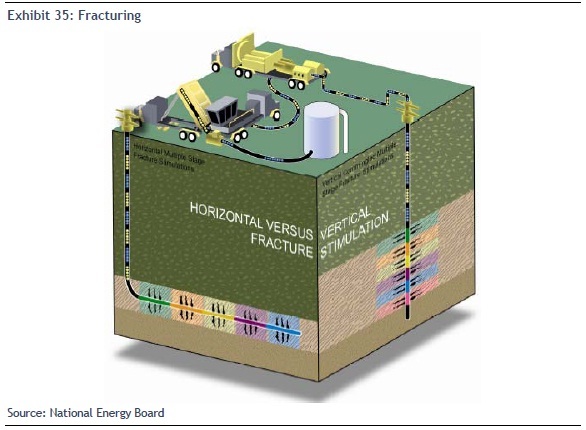 With fracturing, fluid such as water or oil is pumped down the hole under sufficient pressure to create cracks (fractures) in the formation. Proppant—a hard substance like sand or ceramic—is injected with the fluid, and as the fluid disperses, the proppant remains to prop open the fractures, thereby increasing the flow of hydrocarbons (Exhibit 35). During the course of production, a well may require remedial actions to maintain or improve its production. These operations are frequently called workovers and use workover (or service) rigs. A service rig can look like a small drilling rig and performs tasks like cleaning out a well (removing obstacles that are obstructing the flow of hydrocarbons, such as sand, wax, or rust build-up) or retrieving and replacing a faulty downhole pump.